Friends of Music’s next recital will take place on November 15 and features violinist Christoph Seybold and pianist Liezl-Maret Jacobs. 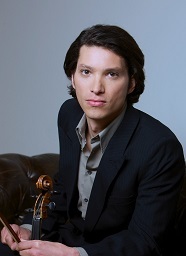 German born Christoph Seybold is one of the most interesting and promising violinists of his generation. Seybold showed great musical talent at an early age. While he was still in Pre-College, Justus Franz invited him on his first solo tours with the Philharmonia of the Nations in Germany and Japan. Liezl-Maret Jacobs is one of the leading chamber musicians and accompanists in South Africa. She performs as soloist with South African orchestras, presents music workshops to teachers, gives master classes for pianists at elementary to advanced levels. She is in demand as accompanist for visiting artists and regularly accompanies at national music competitions. Together with Boris and Elena Kerimov, she formed a piano trio and they appear regularly in concerts. Liezl-Maret runs a private studio in Durban, teaching piano students of all ages. Seybold and Jacobs with present a programme which includes Beethoven’s Violin Sonata No. 5 in F major, Opus 24 (Spring Sonata); Mozart’s Violin Sonata No. 21 in E minor, K. 304 and Strauss’s Violin Sonata in E flat major, Opus 18. The Prelude Performer for the evening will be Kialan Pillay who started playing piano at the age of three and completed his Piano Level 5 Trinity College Exam 2013. He will perform Sonata in F major (k332) first movement by Mozart; Prelude in E minor by Chopin and Notturno by Grieg. The recital will take place on November 15 at 19h30 at the Durban Jewish Centre, 44 K E Masinga (Old Fort) Road in Durban. Tickets R100 (R80 FOM members, R20 orchestral / students).